Working on prototypes, a lot can change quickly. It’s good to have a record of previous iterations so you can revisit the changes and decisions you made in the past. I like to keep a running log for each round of research, recording what hypothesis we set out to test, how it worked, and what changes we will make for next time. Following Gemma and the Service Manual team’s example, I’ve started archiving the prototypes so we can go back and see how it has developed over time. This is useful to compare different iterations of a design side-by-side and to track progression over time. Using a combination of git, GitHub and Heroku, making an archive is easy. The trick is to use tags. Once you have tagged your iteration you can then create a Heroku app to host it. Heroku lets you have up to 5 apps on a free account, but you can verify your account by adding a credit card for 100 apps (no money is charged to the credit card). I have one main Heroku app (username: iteration / password: prototype) which always has the latest version of the prototype, and I list all the previous versions in the index file. All the code shown is from the Terminal. You only need to type the code in bold, the other code is what the computer outputs. The $ symbol means the computer is expecting input. You can leave a message with your tag, similar to commits. This is known as an annotated tag. $ git tag -a version-1 -m "First iteration of form for research"
It’s probably easiest to use lowercase letters and hyphens instead of spaces in the name of your tags. Each version of the prototype will be hosted on a separate Heroku app. To do this, you can create Heroku apps on the command line using the Heroku Toolbelt. You may have noticed that the last commit is to add a link to the previous version to the index page. This makes it easy to revisit previous iterations of the prototype to see how it has evolved. We can now create the version-2 tag, and push the tags and code to Github and our main Heroku app. $ git tag -a version-2 -m "Prototype with one thing per page"
I created another new Heroku app and deployed my code to it. You can see version 3 of the prototype at http://iteration-prototype-v3.herokuapp.com (username: iteration / password: prototype) and I have the main Heroku app which lists all the previous versions at http://iteration-prototype.herokuapp.com (username: iteration / password: prototype). You can view your tags on Github by clicking the releases tab. 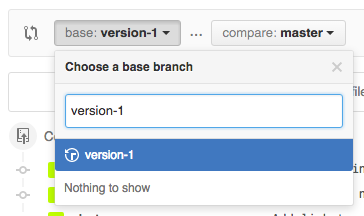 You can compare changes between tags using the compare view, by either typing in the URL in this format: github.com/username/repo/compare/tag1...tag2 or by choosing a branch, clicking the compare button, then typing the tag name into branch selector. If you need to tag a commit you made in the past you need to checkout the commit and add the tag. If you want to push an older tag to Heroku the easiest way to do it is to checkout the tag then create a temporary branch. You can then push the branch to the Heroku remote. More information and documentation on tagging is available on the git website. This looks great ... however on my team we have me (interaction designer), the content designer, and an apprentice developer all working on the repo (Github yay!) - how would this work with multiple collaborators? Never mind - re read and answered my own question. I suspect that one person does archiving, the others just work on the current version! Hi Vicky, that's right – you can continue to collaborate as usual, and it doesn't have to be the same person doing the tagging each time either.